NOTE: The author of this article is a Central European University (CEU) graduate student. 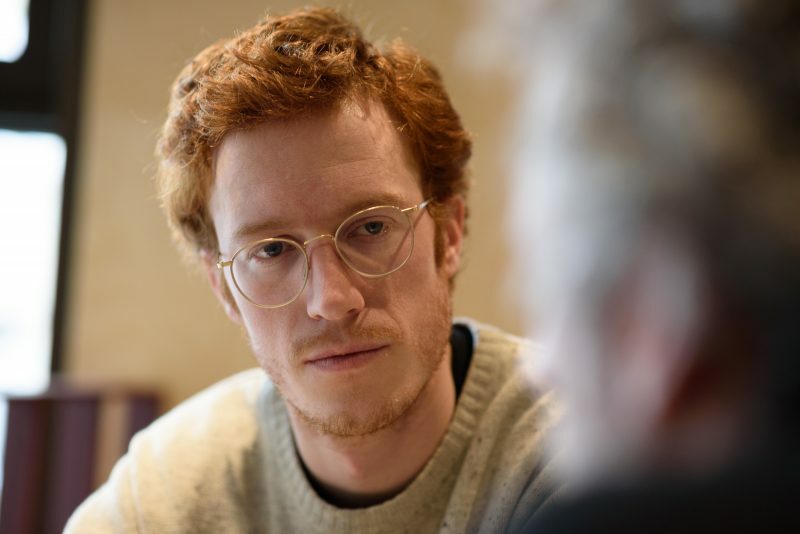 He has been called the ‘perfect enemy of the Orbán regime’, but Belgian-Canadian Adrien Beauduin says it is all a misunderstanding. Beauduin, a Gender Studies PhD researcher at the Central European University (CEU) in Budapest, was arrested during a protest last week at Parliament square and is now being charged with ‘violence against a representative of order’ — a charge which could lead to 2 to 8 years in prison. Protests against Hungarian Prime Minister Viktor Orbán’s right-wing government started 8 December in reaction to the so-called “slavery law” which would raise the cap on annual overtime that employers can request from their workers to 400 hours, and another law which makes it easier to place judges that are favorable to Orbán’s government in seats of judicial power. Since Orbán took power in 2010, he has been accused of eroding democratic freedoms by progressively controlling the media, eroding judicial impartiality, and curbing academic freedom with the amendment of the higher education law that is ousting the Central European University from the country. 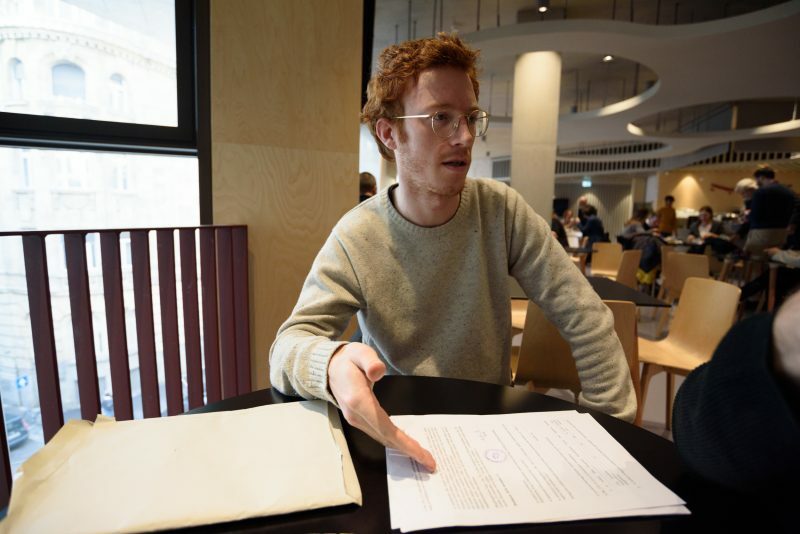 Global Voices spoke with Beauduin on campus at CEU about his student activism in Hungary, the night of the protest, and how he plans to prove his innocence. Global Voices (GV): You have been an active member of the Students4CEU student activist group. What are the activities have you been doing? GV: The student protests were over when the 1 December deadline passed and CEU made its final decision to [leave Hungary and] establish a campus in Vienna. Have you been active since then? 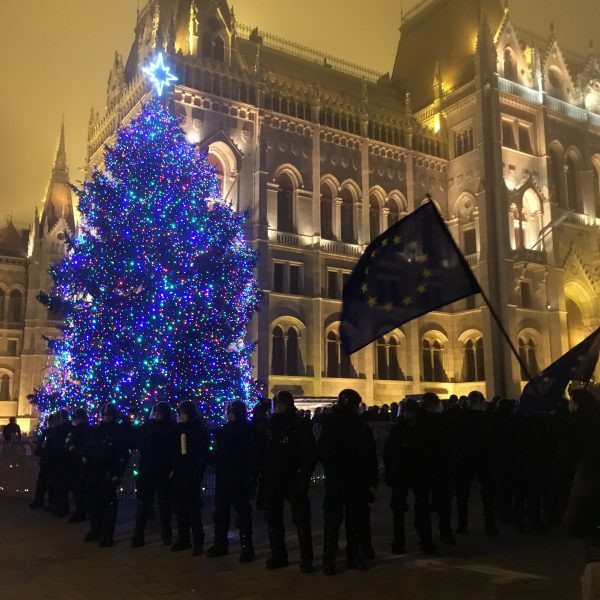 Christmas tree with riot police at the Parliament square on 13 December 2018. Photo credit Marietta Le. GV: What happened there, were speeches made? GV: Did they pick up more people? AB: I didn’t see that at first but at the place I was brought, under the arches of the Parliament, there were four other people with me. Those people were with me at the police station and at the procurer’s office. The five of us were accused of exactly the same thing. Group violence against a representative of order. We have literally the same charges. All five of us as far as I know based on what the others told me in the cell are accused of hitting with their left arm and kicking towards the police. It would be quite strange that all of a sudden all five of us decided to hit with the left arm and kick…But it’s a very serious crime here in Hungary, probably everywhere. It means 2 to 8 years in prison, and my lawyer says that if I’m found guilty there wouldn’t be a lot of chance to avoid prison. GV: Is there a way for you to challenge this now? GV: What’s your advice for people in a similar situation? Sounds like this could happen to anyone in any Hungarian city these days. GV: I know it’s not an easy question to answer but what do you think about the events of the past days? GV: How is your end of term going?